WASHINGTON (CNN) -- President Obama prepared to take his push for health care reform to the American people in a Wednesday night news conference, with the debate focusing on how much overhaul is needed. President Obama is expected to urge Congress to act on health care during his news conference Wednesday. Republican opponents of Democratic bills in the House and Senate say most Americans like the current system and that efforts should focus on making it less expensive and more accessible. "We ought to target the problems, and there are ways to do that on a bipartisan basis," Senate Minority Leader Mitch McConnell of Kentucky told reporters in what was billed as "pre-buttal" to the Obama news conference later Wednesday. Obama and Democratic leaders say the problems are deeper and systemic, with spiraling costs that eventually will bankrupt the country and the current figure of 46 million people without health insurance rising daily by 12,000. The president wanted both the House and Senate to pass bills before going on their August recess, but that timetable appears unlikely due to fierce Republican opposition and cost concerns from fiscally conservative Democrats. Republicans oppose a government-funded option and requiring employers to provide coverage. They also call for limits on medical malpractice lawsuits, which Democrats don't favor, along with a number of provisions contained in the Democratic bills, including increased efficiency in Medicare and Medicaid and focusing on preventive health programs. On the Senate side, top Democrats and Republicans of the influential Finance Committee are working behind closed doors on a compromise measure that would be the first bipartisan bill. Sen. Max Baucus, D-Montana, the committee chairman, said Wednesday that he gave Obama a rough timetable for reaching an agreement -- the first time he has signaled an end date for the private talks. "It's gonna take time but we'll get there," Baucus said a day after Democratic sources privately expressed frustration with the slow pace of the Finance Committee negotiations. On Wednesday, Utah Sen. Orrin Hatch, a leading Republican on the committee, dropped out of the private talks, saying he opposed the direction they were heading. Hatch criticized the bill's nearly $1 trillion price tag as too high, and said he opposed a number of methods under consideration to pay for the package. Another Republican on the panel, Sen. Charles Grassley of Iowa, downplayed Hatch's role in the talks so far, saying "he hasn't been involved for months ... so we just assumed that he was not participating and it doesn't really mean anything." Grassley added that the Finance Committee is not considering a government-funded private health insurance option favored by Obama and Democrats. Instead, it is looking at health insurance cooperatives that would offer collective policies to members. "The ideology that I think would be best expressed is Democrats believe government ought to run more instead of less and Republicans believe it ought to run a heck of a lot less," Grassley said. Over on the House side, fiscally conservative Democrats known as Blue Dogs are seeking changes to the bill introduced last week. The House version includes a tax surcharge on wealthy Americans, but the nonpartisan Congressional Budget Office says the surcharge will raise the federal deficit over the next 10 years. The Blue Dog Democrats comprise enough votes to defeat the health care bill in the House Energy and Commerce Committee. One of the Blue Dogs' top concerns is ensuring that any change to the health care system does not add to the federal deficit. "We are making progress; however, we have a long way to go," Rep. Mike Ross, D-Arkansas, a leader of the fiscally conservative "Blue Dog Coalition," said in a written statement. "Some of the issues that the Blue Dogs have put forth are issues that we all are concerned about," she told reporters. "We want to squeeze as much savings out of the system as we can before we seek any [new tax] revenue. [But] you can only go so far." However, she said the House Democratic leadership has the votes to pass a health care bill -- a claim that was immediately challenged by an anti-abortion caucus that fears the House bill will create a government-run insurance plan that covers abortion services. "It would be easier to fit a camel through the eye of a needle than to pass this bill," Rep. Bart Stupak of Michigan said. He claimed the abortion issue would cost Pelosi too many Democratic defectors to get the bill through. Stupak said he doesn't want to block the bill, but wants to add language specifying the exclusion of abortion mandates before it comes to the House floor. "Without an explicit exclusion, abortion will [eventually] be determined to be included in [the] benefits standards" by either Congress or the courts, predicted Rep. Joseph Pitts, R-Pennsylvania. "Reps. [Bart] Stupak and Pitts are obsessed with abortion, even though the health care bills don't reference abortion at all," said Ted Miller, a spokesman for the National Abortion Rights Action League. It remains unclear if either the House or the Senate will vote on a bill before Obama's deadline of August 7, when Congress goes on recess. 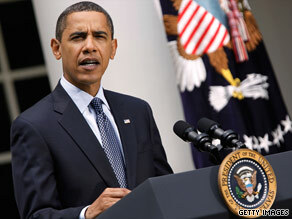 The president indicated recently that the deadline is more a target for progress, rather than a make-or-break moment. Several national surveys suggest that time may be working against the administration's health care initiative. A new CNN Poll of Polls released Wednesday suggested 47 percent of Americans approve of how the president is dealing with health care reform, while 44 percent disapprove. The CNN Poll of Polls is an average of the three most recent national surveys: USA Today/Gallup (July 17-19); ABC/Washington Post (July 15-18) and CBS News (July 9-12). The ABC News/Washington Post poll, which was released Monday, shows Obama has a large advantage over Republicans on the issue. Fifty-four percent of those questioned said they trust Obama to do a better job handling health care than Republicans in Congress, while 34 percent put more faith in congressional Republicans than the president. CNN's Ted Barrett, Deirdre Walsh, Dana Bash and Paul Steinhauser contributed to this report.